1947 MG TC .. Enhancement Detail & Roof re-colour & Protection. Convertible hoods are tough to keep clean and are prone to fading, when not maintained. Kept outside they can age very quickly. Fabric hoods can attract mould and moss, while the plastic rear windows often fitted on cabriolet vehicles can become cloudy and scratch easily. Without maintenance, you can expect a convertible hood on a cabriolet to last around 6-8 years before it will need replacing – caring properly will double this life span to around 12 years which is the life span of most cars. As a replacement hood can cost between £600 and £3000 depending on the model, it makes good sense to reproof your hood every year. * For a 4 seater convertible cars please add additional £50.00 to the above prices, all prices are subject to viewing. Please note this is not offered as a mobile service as we need a controlled dust free enviroment. CQuartz FINEST Reserve is an evolution in coating technology, unique in it’s design and hybrid resin. In the development of Finest Reserve, high strength, condensed nano particles with superior cross linking abilities were created utilizing a new proprietary nano material to create an extremely tough 3D structure providing a durable, high gloss coating which protects paint and other automotive surfaces from UVA and UVB rays, dirt, brake dust, iron contaminants, bugs, bird droppings, tar, and all sorts of environmental contaminants for more than 3 years. CQ Finest Reserve ushers in the future of automotive paint protection. Extremely low sliding angle ensure less water droplets stay on the surface. High resistance to road salt and acids. CQuartz Finest Reserve has developed a reputation among professionals as the richest, deepest, highest gloss coating available. It is important to note that proper depth and gloss is achieved with proper correction and polishing by an experience detailer with a passion for what they do. However after they have invested countless hours in their craft, it is only fitting to both protect their work long term and add that extra rich depth of the Finest coating available. Anybody that has just waxed their car will tell you – within a couple hours they can see the dust building up on it and after a drive that dust is still there. It doesn’t blow off and it does accumulate on the carnauba wax layer. Polymer sealants are a little better and stay cleaner than waxes however they too allow dirt and dust to stick to them. Compared to wax, dust and dirt retention is lowered up to 90% with CQuartz Finest Reserve. Of course some will gather and collect over time but you will enjoy the beauty of your vehicle between washes when protected by Finest Reserve where as with other products the paint will look dirty faster. In the air around us and on the motorways, all sorts of contaminants attack your paint. Iron particles coming off the brakes of other vehicles can lodge into your paint and allow moisture to penetrate around them. Over time the oxidation process from moisture and sun break down around these iron particles and eat microscopic holes into your paint. CQ Finest Reserve puts an end to this with a thick barrier that does not allow these contaminants to reach the paint surface and are removed much more easily. Protection from bugs:They come in all shapes and sizes. Many are highly acidic and can wreak havoc on your paint! They impact the front of your vehicle at high speed and as they impact the acidic contents spills out onto your paint. Within minutes it can eat through a layer of traditional wax before it dries and bonds hard to the surface in the heat of the sun. If the bug is highly acidic it will begin the process of etching into your clearcoat in a matter of hours. Each time it is exposed to moisture more acids are released and eventually you have permanent danbsp to your paint. With 3µm of CQuartz Finest between the bugs and your paint they can no longer cause permanent danbsp to your paint, the coating is resistant to acids and its rare any mark will be left on the coating with reasonable washing schedules. In the rare case a bug does leave something behind you can be rest assured your paint is still safe beneath the coating. The most dangerous enemy your paint will likely see in its life is bird droppings. They can vary in level of toxicity but it is well known by professionals that a bird dropping can dissolve wax on contact, eat deep into paint, and leave an etching within minutes. With CQuartz Finest Reserve you have a barrier which resists bird droppings and allows you time to discover and remove them.. It is still recommended you remove bird droppings as quickly as possible to stop them damaging the Cquartz Finest Reserve coating. As we touched on previously: dust, dirt, and contaminants do not bond to your CQuartz Finest Reserve barrier in the way they do to paint with only a coat of wax or sealant applied. Any dirt or dust that does attach to the coating is MUCH more easily removed upon the next wash without having to scrub or clay the vehicle. CQuartz Finest Reserve offers dirt and water shedding abilities beyond that of any other product available with a sliding angle of just 10 degrees providing the self-cleaning affect provided by CQuartz Finest Reserve, most dirt slides right off during a wash.
One of the most important features in keeping your vehicle clean is the ability of the protective layer to release water. Finest features a low sliding angle which allows water drops to release easily keeping your car cleaner for longer.. Your Finest Authorised Detailer uses only top tier products on your vehicle. They start with our specifically designed shampoo followed by an extremely detailed 2-3 step decontamination process to remove all bonded contaminants from above and beneath the surface of the paint. Following the “decon” process the paint is further analyzed and the best combinations of high tech pads and polishes are tested to produce the highest gloss possible. This may include polishing the entire vehicle up to five times to reach this level. After the paint is perfected all the polishing oils are stripped from the vehicle with the use of CarPro Eraser. This step is essential so that CQ Finest Reserve will fully bond with the paint. When the paint is determined to be 100% oil free, 2 layers of CQ Finest Reserve are applied and dried with specialist short wave infrared drying lamps. Additional services including coating of interior, glass, convertible top, plastic trim, brightwork, and wheel coating are also offered by our installers. You can find more details above under “Upgrades”. CarPro Finest Installers make up a global network of professionals who proudly offer a warranty on our flagship coating. This warranty states that Finest Reserve will not bubble, yellow, peel, oxidize, or lose more than 20% gloss over 3 years. Waxes and sealants offer little to no swirl resistance. When you wash, dry, or touch your paint at any time you have the potential to scratch the surface. The scratches we are talking about here are very fine and referred to as “swirls” but as they build up the level of gloss you see as reflections and depth to your paint withers. These swirls refract light away from your eyes which is the cause of a dulled appearance to your paint. CQuartz Finest Reserve has been proven to resist these fine swirls when properly maintained and cared for. It should be noted that no coating is swirl proof and it is important to use only high quality wash mitts and drying towels or a warm air blower. We highly recommend allowing your Authorised Finest Installer to either maintain your vehicle or train you in proper wash techniques and provide access for purchase of the incredibly soft and plush CarPro Merino Wool Wash Mitt. 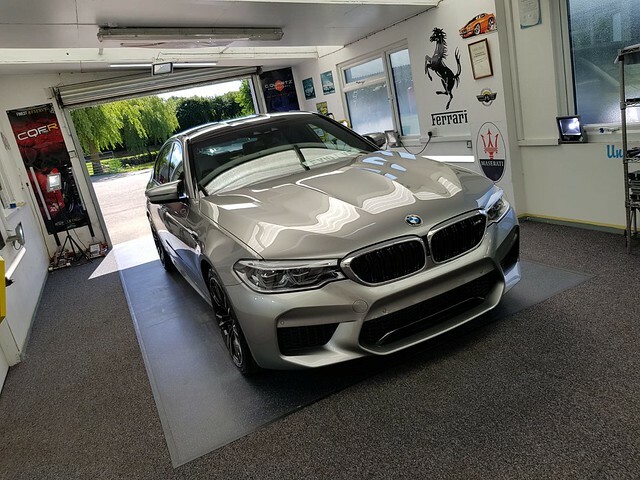 Unlike other coatings, Finest Reserve cannot be purchased on the open market and is available exclusively via our tier one CarPro approved detailers who have been hand selected to ensure you recieve only the highest quality service available. C.Quartz Finest Reserve MUST be cured under the correct infared lighting systems… only avaliable through Tier1 Professional Detailers. Diamas Professionali: Aggregated Diamond Nanorods. 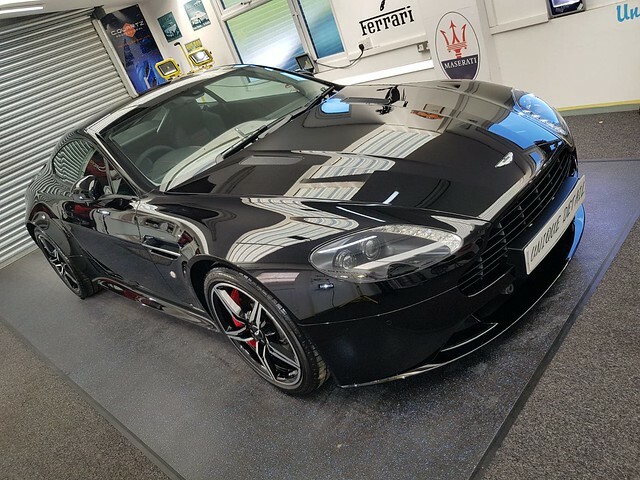 SiRamik Glasscoat are proud to be the first paintwork protection brand in the world to introduce a true diamond coating for vehicle paintwork. Over 12 months of research, testing and development have now come to fruition, and can now unleash the ground breaking technology of “Daimas Professionali”. Diamas Professionali contains aggregated diamond nanorods, sometimes referred to as ADNR’s, with this we have taken liquid protection to the highest possible level, where crystal clear paintwork is the result of an optically clear coating that will not mute any metallic flake, pearl or solid colour, meaning the paint you choose is the paint you see. It is commonly known that diamonds are the hardest material known to man, not to mention the most precious. Diamas Professionali utilizes ADNR’s in sizes no greater than 3-4n, meaning on a nano scale these are used as an anchor for the coating which in turn strengthens the layer applied, giving a more stable protective barrier, as a whole ADNR’s have a combined strength of which has been measured at stronger than a diamond itself. Why is Diamas Professionali different to other coatings? Diamas differs to other coatings because of not only the chemical make up and blend, but it’s “water contact angle”, with a contact angle of up to 112 degree, water moves rapidly over the surface giving superior self cleaning, somewhat similar to a lotus leaf. However this is not the only fact that sets the coating apart, as also the receding contact angle is extremely low and water will begin to slide at 20 degree angles or greater. 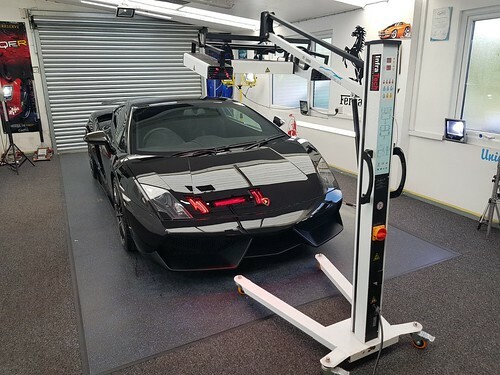 This is where Diamas Professionali is breaking barriers within paintwork protection, non wettability through excellent hydrophobicity and sliding angles combined. Diamonds have a high refractive index meaning light does not pass straight through, but bounces back and forth. Diamonds also exhibit fluorescence giving an appearance of multiple light sources that provide the “prism” effect, whilst the dispersion of light is only moderate the refractive index allows light to hit the paint particles, bounce back and around & not straight through, making the particular paint type outstanding in class, enhancing the particles and allowing the owner to see the true value of the paintwork beneath the protective layers. Diamas Professionali is used in conjuction with the SiRamik APT Systems and forms the final coating of a 3 part system. The first part is a Heat Resistent coating, followed by a coating of Ultima, and finally the jewel in the crown, a coating of Diamas Professionali. Price per layer of the Diamas coating is £150.00-£175.00 in addition to the APT system and detailing service. Diamas Professionali is only available through the Siramik Glasscoat accredited network of detailing professionals. Below are a few vehicles that have been prepared with SiRamik APT coating and Diamas as the last stage. I just wanted to drop you a note to thank you for the New Car Protection you did on my BMW M5. Now that I’ve been able to see it in the sun, I can see how fantastic the Seramik and Diamas coating is and it still looks clean after a week of use, the rain/spray/dust doesn’t seem to stick. It’s been well worth it and I’d whole heartedly recommend this to anyone with a new car and, based on my experience, any of the services you offer. In particular, I really appreciated the communication about the whole process and the post-detailing advice you gave to keep it looking good: I’m all fired up to keep it looking pristine. Our ceramic coatings are cured under Infared lighting to ensure correct bonding. This service is for new vehicles. Unfortunately even new cars delivered to showrooms are characterised by many imperfections. During transport by road or rail the car external surfaces are exposed to a lot of damage and very basic factory protection does not secure them enough. is performed by valeters (On the site) who frequently use poor products with minimum knowledge of how to properly take care and prepare your car to go on the road. For customers who want to receive the highest quality of preparation and protection to their cherished vehicle with the use of the best products on the market I would recommend this treatment along with regular maintenance and care for the best appearance of your car after purchasing. Unique Details New Car Preparation and Protection Detail is a service designed for new cars. We class a new car as new with less than 500 miles on the clock, if you vehicle has exceeded this mileage then additional charges could apply. For customers whose car has recently left the showroom, I recommend you take this treatment as soon as possible. The vehicle is re-washed show car shampoo and rinsed off. High quality rain and water repellent is applied to all the external windows and mirrors if required. Interior is fully cleaned all seats & carpets are fabric protected/Leather is conditioned & protected. If you wish to upgrade too Ceramic and Glass coating please see below for additional prices. Please note the above Ceramic coatings are in addition to the standard new car protection Cost,and the vehicle is required for 2- 3 days for curing purposes. Sorry it’s taken a while keep forgetting to email you! But I just wanted to say thank you for doing the paint protection on my Focus ST it really does make it easier to clean and stays clean for longer I would Definitely recommend you to anyone and have followed your recommendations regards cleaning which has helped keep the paint work swirl free. This details offers protection for your vehicles exterior including wheels, glass and paintwork,we offer various protection methods using a different variety of waxes and sealants this way there is a budget that suits everyone with our winter protection. Protect your investment from every thing this winter will throw at your cars paintwork. We have clients who travel to us for Detailing as far as France, London, Radlet, Slough, Farnborough, Reading, Aldershot Guilford and Oxford. and to the North and east of us Norwich, Peterborough and Great Yarmouth with many more to mention. Unique Detail are proud to announce there accreditation with SiRamik Glasscoat. This is a 2 part coating system that contains extreme elements of Silicon to form an ultra durable and tough coating that has the ability to withstand levels of bird lime, paintwork marring and the like, with a potential durability of over 3+ years. 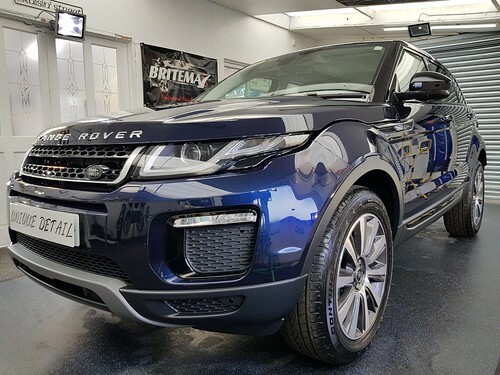 Advanced Protection Technology takes 2 coatings where combined boast 175% glass coating ingredient, to produce not only a super durable protection package, but one that looks stunning with extreme levels of gloss. 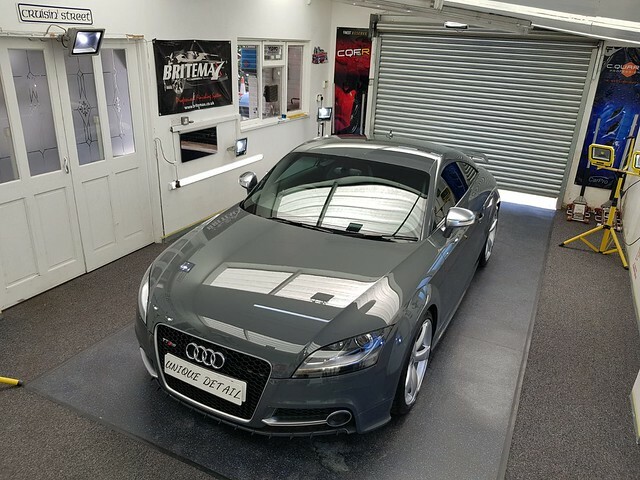 Ultima is the upper coating of the APT system that will provide the extreme gloss and crisp clarity that will create an unbelievable hydrophobic layer, adding further protection and superior cleaning abilities. Ultima is also as with SC-HR, suitable for all plastics where durability is again excellent. As with coatings of this technology most would require infra red drying times but Ultima is a 60 minute fast cure with no IR needed, however overnight curing indoors is imperative to the coatings initial protection. How and where is it applied? APT (Advanced Protection Technology) can only be applied in a controlled working environment by a recognised and accredited Siramik Glasscoat application specialist. The vehicle in question will be subjected to numerous levels of decontamination and cleansing processes, prior to any machine polishing correction that may be required (additional costs may incur dependant on the level of defects), before finally applying no less than 2 layers of the coatings to the paintwork and 1 of SC-HR on wheels. Price: From £275.00 in addition to other Detailing Services. Diamas Professionali contains aggregated diamond nanorods, completely unique and a world’s first in protective coatings. Diamas has taken liquid protection to the highest possible level, where crystal clear paintwork is the result of an optically clear coating that will not mute any metallic flake, pearl or solid colour, meaning the paint you choose is the paint you see. Prices from £160.00 Per Layer. You did my pearlescent white M3 back in January. I’m glad I went for the Diamas Professional. It’s truly fantastic and I am very happy with the work you did. The car is not a daily driver and it rarely goes out in the rain, but when it has it needed only a brief detail to get it spotless again. On the attached you can see what appears to be traffic film on the rear wheel arch after a couple of hundred miles driving in rain on the motorway and country roads. Other than that the car was spotless and the traffic filmed wiped off easily and had not adhered to the paint. Thank you for recommending Diamas and the great detailing work.